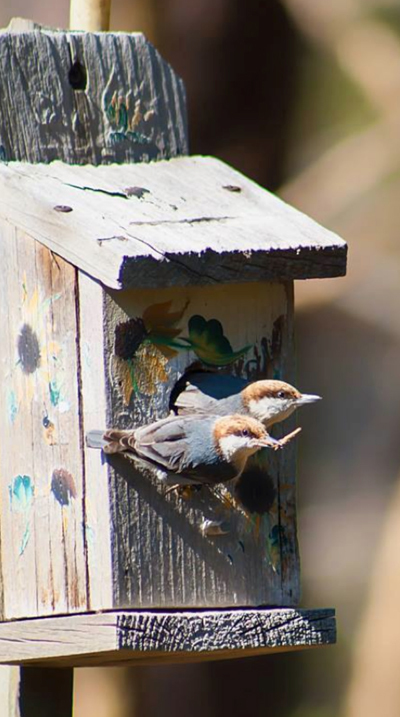 As the nesting season for Brown-headed Nuthatches comes to a close for this year, TGPAS has much to brag about. Thanks to you, TGPAS members and friends have helped to provide 230 homes in our area for these spunky little birds. Hope you have been one of the lucky ones that got to watch nesting birds. Data from 60 of our boxes has been reported to TGPAS. 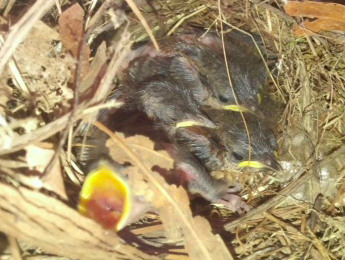 Thirty-nine boxes had nests: eight Brown-headed Nuthatch nests, 30 Carolina Chickadee nests, and one House Wren nest. On the TGPAS Nest Watch group site, 44 nest boxes have been registered. If you reported to us already, thank you. But if you did not, it is not too late to report data to TGPAS (send to stellaandtom2605@gmail.com) and enter your nesting data at www.nestwatch.org (user name: TGPASociety, password: bhnuthatch). Data reporting to Nest Watch is the way Audubon NC knows what the NC birds are doing. As TGPAS members no doubt know by now, Audubon is promoting its Bird Friendly Communities project. This is a partnership program that focuses our conservation efforts in the urban and suburban communities where most of us live. All of us can create lawns and gardens that support healthy populations of birds and other wildlife. Our chapter is doing its part. We are helping our members learn more about native plants that we can use around their homes. This is our fourth “Going Native” installment in our newsletter that spotlights great native plants for our homes. In addition, we have given away seeds and plants of native species at our meetings to help our members get started. 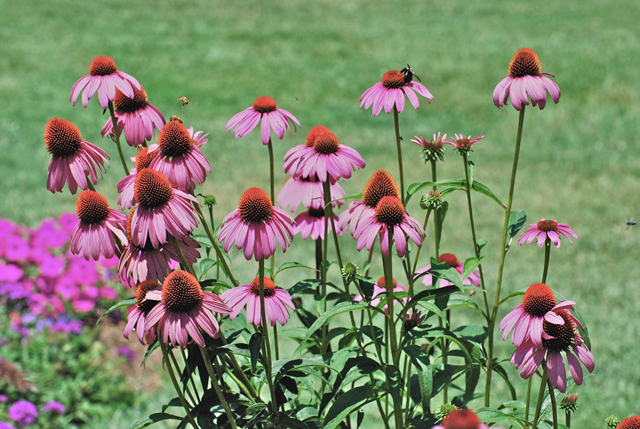 In this month’s Nature Notes we’re directing our attention to Purple Coneflower, Echinacea purpurea. This is such a popular flower for the home garden that many people already know about it for its beautiful long-lasting blooms. What may not be as well known is that it’s a great bird friendly plant, too. The blooms are large, often four inches or more across on stiff leafy green stems that can get to about three to four feet tall in good conditions. As the English name suggests, the natural color of the blooms is purple. However, this is such a popular plant that growers have been producing color variations from white to pink to red, and recently even yellow and orange have been introduced, so you have many color choices in addition to the natural purple. Because it’s a tall and leafy plant, it goes nicely behind shorter flowering plants. The plant does well in a variety of soils including our soil types here in the Triad. It prefers full sun but can take partial shade, especially in late afternoon. Like many native plants, it is low maintenance and only needs water during the driest part of the summer. Purple Coneflower is a great addition to a garden to attract native pollinators that we need for other flowers and vegetables. Butterflies love it, as do bees. From time to time a gardener may find small caterpillars on the leaves. These will provide food for birds, especially during nesting season. When it begins to go to seed, you can collect some seeds for next year, but the birds may beat you to them! 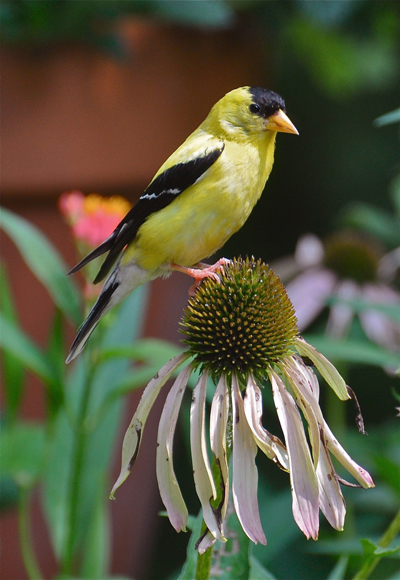 Purple Coneflower will attract American Goldfinches and other seed-eating birds. Would you like to see what it looks like in a garden in person? The Greensboro Arboretum has a nice patch of it planted among other flowers in the Perennial Garden next to the vine arbor. 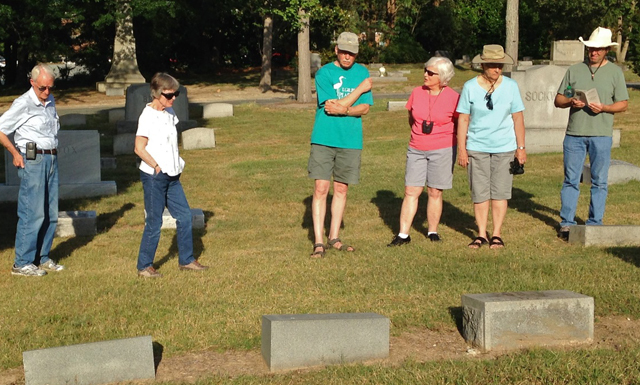 Seven people visited Green Hill Cemetery for our evening walk in June. In the top image, members pay their respects at the grave of T. Gilbert Pearson, for whom our chapter is named. Everyone enjoyed the guided tour of trees presented by Dr. Douglas Goldman (bottom photo). 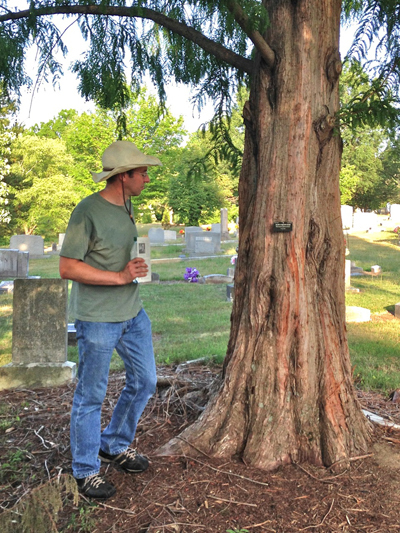 According to the City of Greensboro, Doug spent more than 400 volunteer hours in 2014 cataloging and labeling the various trees and shrubs within the Green Hill Cemetery. The Green Hill Cemetery has nearly 500 labeled trees and shrubs, and by the end of the project, this number is expected to exceed 600 labeled botanical specimens. 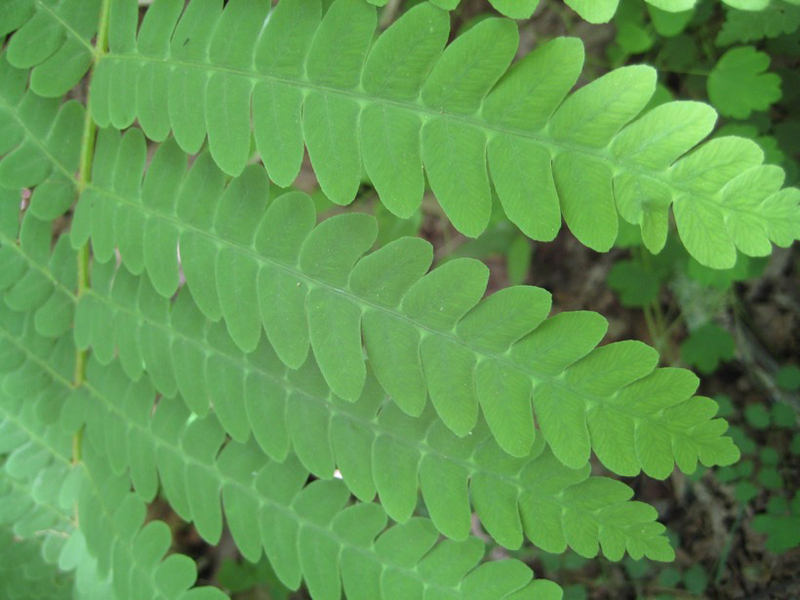 When: Saturday July 18, 2015 @ 8:30 a.m.
Would you like to practice your fern identification skills? Join T. Gilbert Pearson Audubon members for a stroll in the Bog Garden to find and identify ferns. 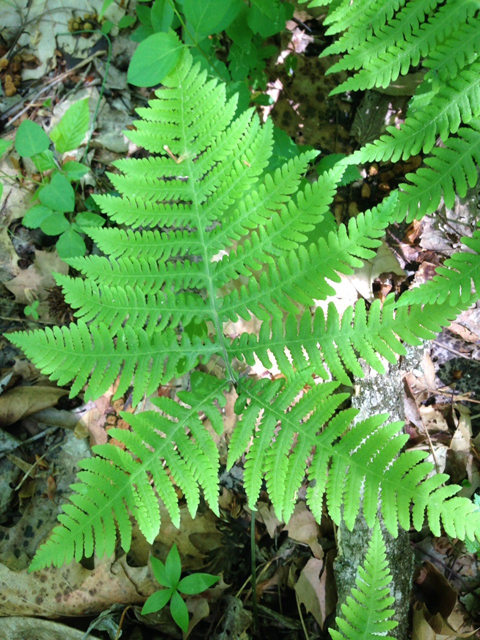 We will be using Fern Finder (click here) by Anne and Barbara Hallowell as our guide for observing key features of the ferns and identifying different species. Bring a copy of Fern Finder and a hand lens, if you have them. If you have another field guide to ferns, bring that. But most of all, bring an interest in ferns, as we will help each other learn. If you have questions, contact Ann Walter-Fromson at annwf7@gmail.com. See you at the Bog! Our last Beginning Birder Walk of the series for this program year will be on Sunday afternoon, July 19, from 1:30 to 3 p.m. We’re doing this jointly with Piedmont Bird Club. We will meet in Price Park in front of the KCEF Branch Library, 1420 Price Park Road, in Greensboro. It’s near the intersection of Hobbs and New Garden roads. We have had a good time doing these bird walks for beginners in each of the seasons, one each in fall, winter, and spring. This one will introduce us to our summer resident birds. As we’ve explained before, this is intended to be a fun, laid-back experience especially for beginners, although more experienced folks enjoy these walks, too. The emphasis is on learning to identify birds using clues such as size, shape, markings, habitat, and behavior. We have fun finding and watching the birds in a relaxed, no-pressure setting. As in the past, we’ve called it a walk, but there won’t be much walking involved. We’ll be happy about that as the weather gets warmer! We’ll be in Price Park around the library where we can drop in for a drink of water and to cool off, if necessary. We’ll walk slowly, check out the bird feeders, and practice building our identification skills by watching common birds. Age doesn’t matter; this outing is especially for people who think of themselves as beginners, whether younger or older. The knowledgeable birders in our group started at the beginning, and we will, too. As always, supervised older children are welcome, but no pets, please. We won’t even need binoculars! Birds can be identified without binoculars or field guides, which are just tools to make it a bit easier. On the other hand, if you have them, bring them. We’ll talk about how to use these tools, and we’ll try to answer any questions participants have. 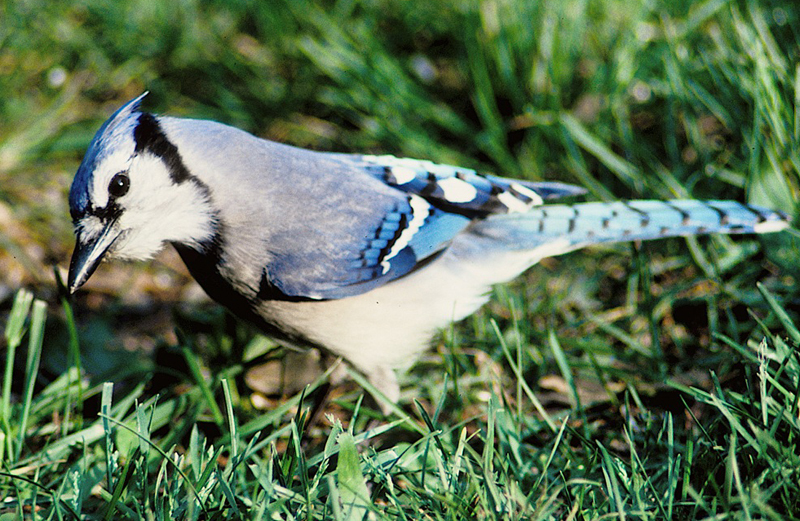 We hope that you’ll join us for our summer bird walk on the afternoon of Sunday, July 19! Carpooling: Meet at 6 p.m. in the Whole Foods parking lot, 3202 W. Friendly Ave. The forest where this park and UNCG's campus now exist was occupied by Confederate Gen.Joe Johnston's army in 1865 just before he surrendered all remaining troops to Union Gen.William Sherman, effectively ending the Civil War. Musket balls and uniform buttons are still found here when working in the woods. In 1901 philanthropist George Foster Peabody established this forested area as the State Normal School's educational park. Although dorms and other buildings now stand on the edge of the original park and some of it has been converted to grass, much of area is still natural and interesting. Four branches of North Buffalo Creek are found here, two in the park woods and two in the fields. 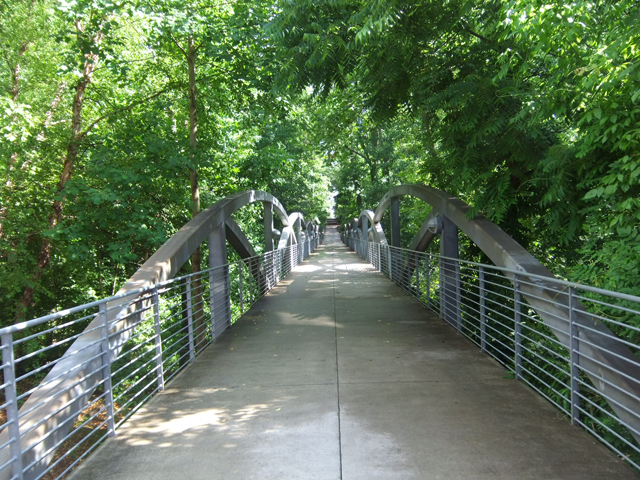 The university has built a foot bridge through the woods allowing walkers to look straight into the mature hardwood trees and down on the forest floor. 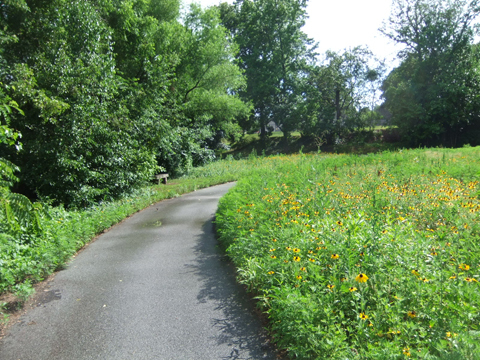 A paved walking path through the park fields invites walkers to amble alongside one of the creeks to look and listen for summer birds and other critters. A small area of the fields has been converted into a Piedmont prairie by UNCG students and faculty. We will take our time on this easy walk to soak in the sights and sounds of this urban forest and fields. We'll not look for anything in particular, but just enjoy the cool of the evening and nature's late-day offerings. Please join us for this summer evening in the park. We will gather at 6 p.m. at the Whole Foods parking area near Friendly Avenue and carpool to UNCG. Through the years we all experience Carolina Wrens building nests everywhere including not the best spots for us humans. In early June, I received a call from my son of an urgent nature, “There is a bird going in and out from under the truck and I think I see some sticks”. 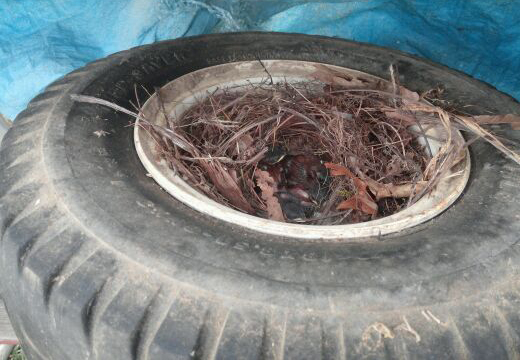 I made a quick inspection, sure enough, I saw signs of a wren nest under the bed of the truck in the vicinity of the spare tire. There was no way actually to see into the nest to get a view of whether eggs or baby birds were present. After several days of trying to decide what to do and comments like, “I do not want to have baby birds falling out while I drive on I-85,” a decision had to be made. We let the spare tire down from the mounting and I crawled under the truck. I was able to carefully remove the nest from the frame and, of course, the birds were in the process of hatching – three tiny wrens and one egg. Okay, things are only going from bad to worse, so what to do now? I start telling my son what to bring (like I know what I am doing), and we start building a new home for the birds. 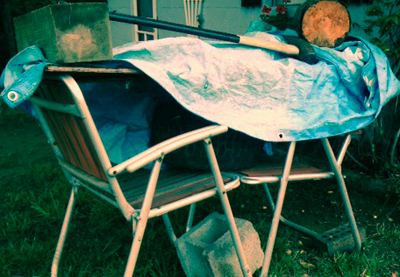 Two yard chairs, one old golf tire with hub, tarp, and miscellaneous pieces of wood and weights later, a new home site for the birds was established. 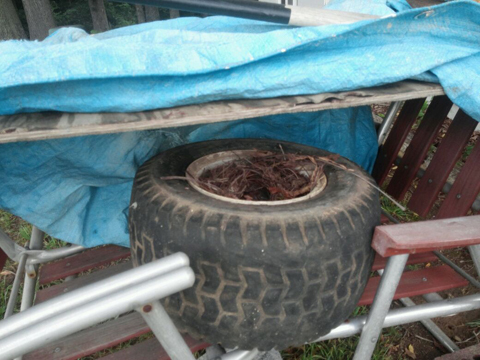 The nest was safely tucked into the tire hub sitting on the lawn chairs covered with everything imaginable for protection from the weather. After looking at this masterpiece, it was dubbed Beverly Hillbillies Wren Home. We had a small rain storm that evening, and the new home and birds survived. It did not take long to confirm the next morning that the parents had found and were feeding the young. To my amazement, the last egg hatched and all four birds were doing well. We carefully observed the nest every day and protected the area, and 11 days later all babies had left the nest. There is nothing better than a good wren story with a successful ending. No matter how many wren boxes are provided, these wonderful little birds will surprise and challenge you with their choice of nest locations. String some peanuts around a tree, bush, or outdoor railing to deck your home out with a bird-friendly decoration. Fruit can make for an additional treat. Mix peanuts and cranberries. Make sure there is no added salt or sugar. Use a needle to string a thread through the mix, piece by piece. Wrap the chain around a tree or bush in your garden, tying down each end so your chain doesn't blow away. If you don't have any plants, you can wind it around a railing or some other sturdy structure. Dispose of the string once the chain is empty to avoid potential hazards to wildlife. Better to be safe than sorry!